Jastine Valdez was an only child taken from her parents at the age of 24 in the most unimaginable circumstance. Born in the Philippines she came to Ireland to study and to join her parents who are now naturalised Irish citizens. Both parents work and are active in the community. 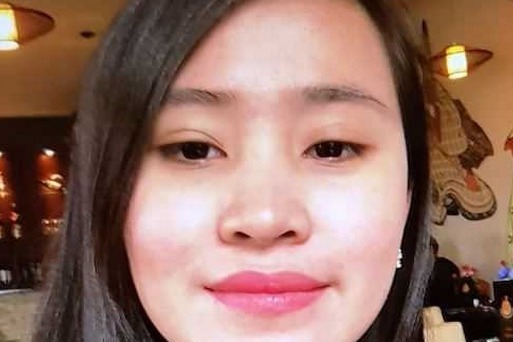 This page was set up to facilitate all of those who wish to offer support and sympathy to the family of Jastine Valdez following her devastating death. The Valdez family have lost their only child, they are facing a situation that no person on this earth should have to face. They are parents saying goodbye to their child. The circumstances on how they lost their daughter are public knowledge and are in the link below so reciting an account will serve no purpose. 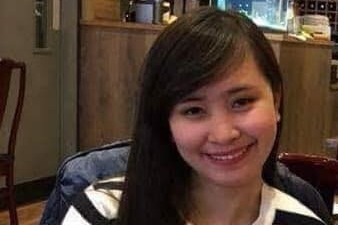 Any and all funds raised on this page will go directly to the parents of Jastine Valdez to help them in the weeks and months ahead. The transfer and oversight of the funds to the Valdez family will be documented and made public. 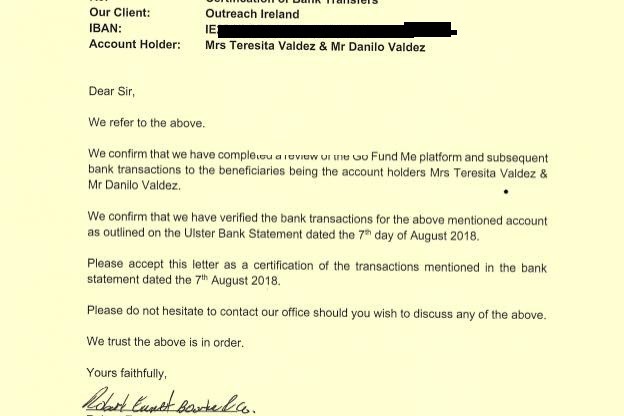 A Dublin based solicitor has offered to oversee and audit (pro bono) the account and will verify all funds are paid directly to the Valdez family. 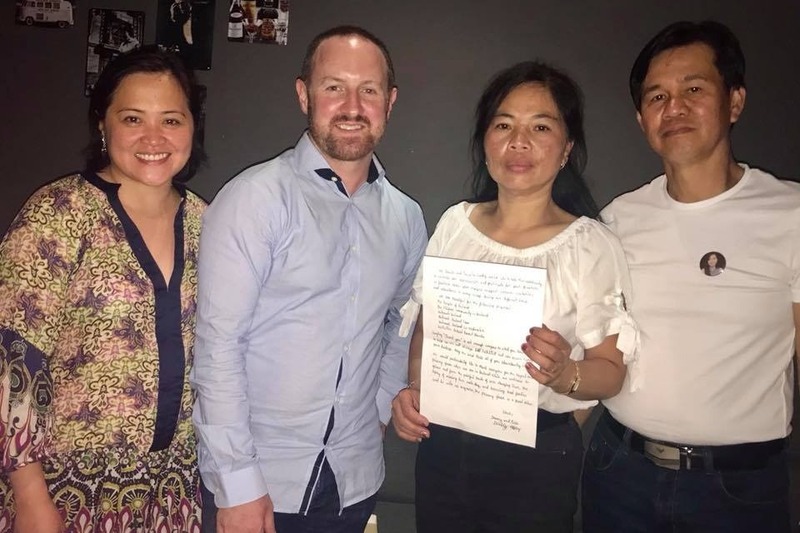 Danilo and Thessie Valdez presented Outreach Ireland a letter of thanks to all those who have given them support, love and prayers over the past few months. Thessie and Danilo Valdez, parents of Jastine Valdez who was murdered on the 19th of May 2018 in Co. Wicklow, have received the funds that were raised by Outreach Ireland through the GoFundMe page set up in Jastine’s name and donated to by over 4,650 people. The funds were transferred to their account in June 2018 while they were in the Philippines. All subsequent donations will be transferred directly to the parents' bank account. Another €2,500 was donated directly to the family by a private trust. Strict documentation and verification requirements imposed by both GoFundMe and Dublin-based solicitor Robert Emmet Bourke of Bourke Law were followed to link the Valdez family account to the GoFundMe page. A full verification of all transactions and the transfer of the funds was carried out and certification of the fact was issued. The oversight provided was free of charge. 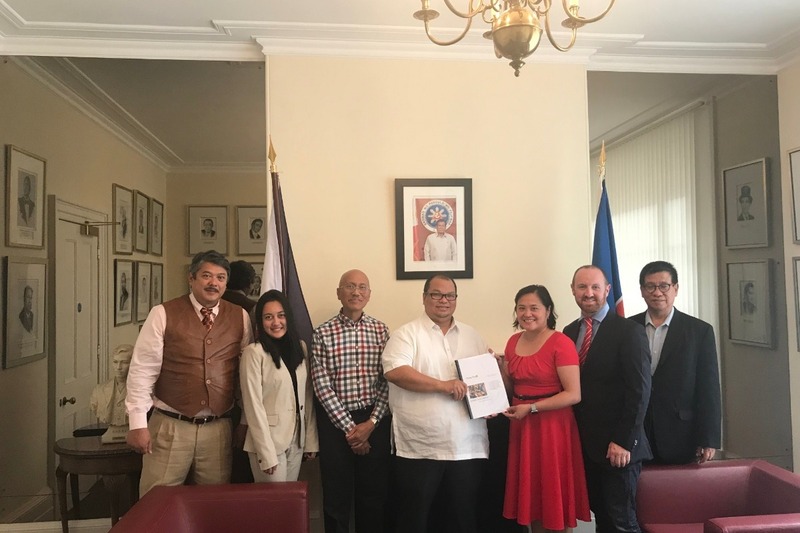 Outreach Ireland, the non-profit organisation that raised the money, presented a detailed report on the fundraiser to the Philippine Embassy in London. They continue to assist Thessie and Danilo who are now back in Ireland but are homeless and jobless. They are staying with a close family friend who invited them while they are looking for a new job and a home. 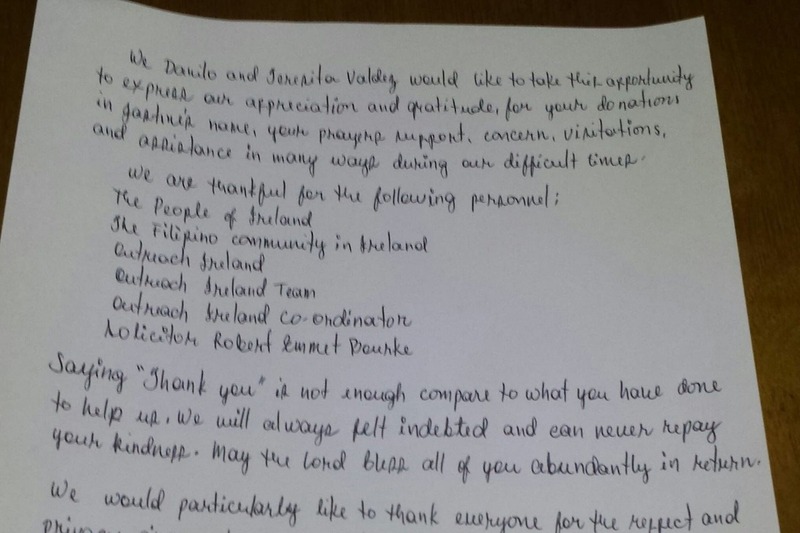 Thessie and Danilo personally gave Outreach Ireland a handwritten thank you letter on the 21st of August 2018 for the general public and all of those who have offered assistance. Danilo and Thessie gave the exclusive interview to share the ordeal they went through and to thank everyone for the undying support and the respect and privacy given to date. They also requested for continued privacy while they try to comprehend how to rebuild their shattered lives. 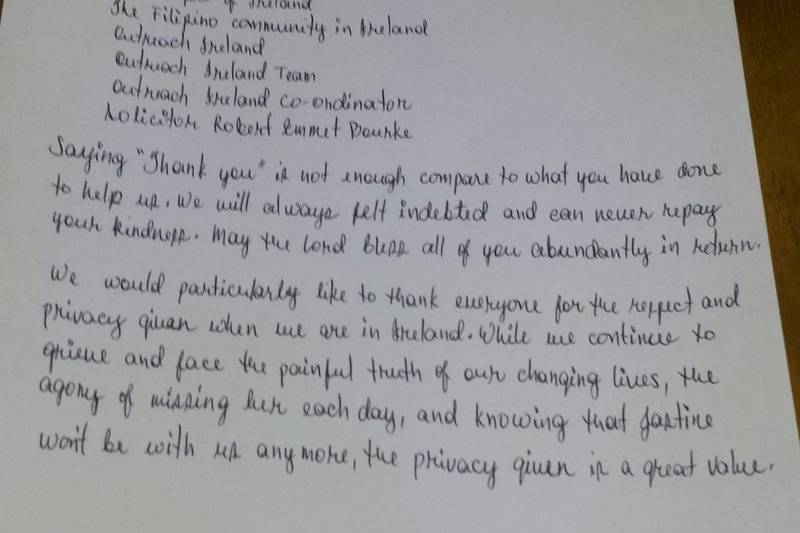 They also gave Outreach Ireland a copy of the handwritten letter that Jastine wrote for them when she was about 18 years old which they only found three weeks after her funeral. They have given permission for this letter to be shared publicly to show the true love that was in Jastine’s heart. The Jastine Valdez Memorial Fund GoFundMe page is still open to receive donations. After the interview was aired, close to €7000 has been donated and the amount is continuing to rise. Various offers of support and a few job leads have been made. Thessie and Danilo are very thankful for all the help being offered. They are currently considering all options and will take their time in making an informed decision when they are ready, as they are also still grieving from losing Jastine at the same time.